So I don't know what happen to my camera settings, I guess since I have been trying to adjust the setting I mess something up. LOL made it worst. These pictures didn't save in a decent size to get cropped or anything. I removed this manicure before I realized the setting were messed up (not the only mani :( ). 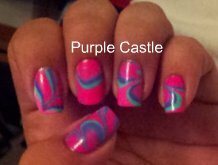 Still, here is what this manicure looked like. Que mal lo de tu cámara... pero la manicura es hermosa! 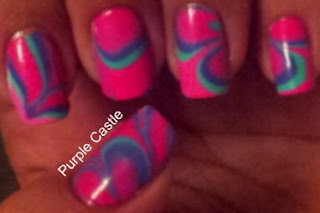 Your water marbling is lovely, I love the colour combination! This is beautiful - I love the vibrant and lovely colors! The colors look so pretty together! Great combo and a lovely watermarble! These r so cute. I am jeleous. I can only do stamping and polishing. Lol. 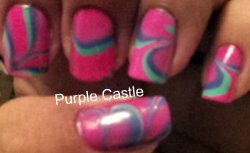 I have never tried marbling yet but I love the effect!! Your very good at water marble. The pattern is really nice. These are so beautiful! I really love that bright pink! Aw the pictures came out cute hehe. I love your mani! They came out amazing!